CAO flavored cigars are a treat to smoke. CAO cigars are known worldwide for their excellent quality and beautiful construction. That same quality is also found in the CAO Flavored cigar line. The CAO Bella Vanilla contains vanilla beans from Madagascar, prized as the best beans in the world. To make this cigar, a mild blend of Dominican tobacco is gently misted with this exquisite extract and finished with a grade-one Cameroon wrapper. Very aromatic and pleasant to smoke. A mild blend of Dominican tobacco is gently misted with exquisite vanilla extract in a very aromatic cigar. Perfectly sized for 30-40 minutes of smoking pleasure. A mild blend of Dominican tobacco is gently misted with exquisite vanilla extract in a very aromatic cigar. Not too long, not too fat! A favorite among the lady smokers. A mild blend of Dominican tobacco is gently misted with exquisite vanilla extract in a very aromatic cigar. Perfectly sized for 10-20 minutes of smoking pleasure. Each tin contains 10 cigars. A mild blend of Dominican tobacco is gently misted with exquisite vanilla extract in a very aromatic cigar. Sweet vanilla combined with long filler premium tobacco. A very smooth and mild bodied cigar. This is the cigar that made Heavenly famous! The very first flavor they created and its INCREDIBLE! Sweet creamy vanilla in every puff from start to finish. Very aromatic and pleasant for even non-smokers. 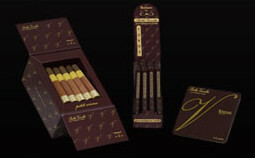 Tatiana Cigars are one of the leading flavored cigars in the world. Every cigar is expertly finished with premium quality flavors. Sweet & Mild!